I used to think of August as nap time in the heat of Southern California's summer, it is SO inviting! Grab a cool drink, find a hammock and get the Dodgers on the radio. Do I hear the muffled sounds of snoring? Ah, August! Not anymore! Not since I realized that growing the food was less than half the battle. Not to say there isn't a lot to do on that account still (more will be revealed very soon) but getting the harvest gathered and making good use of it is another important, and time-sensitive, part of gardening. This week alone, I've harvested 10 pounds of those famous Italian Cannellini beans (a dried bean sometimes referred to as 'white kidney beans' but that refers to the physical appearance and not to their eating or cooking qualities), about as many pounds of peppers – mostly the sweet banana types that I hope to pickle soon. And there are tons of cucumbers I'm hauling in. Did you follow my suggestion and plant any Armenian cucumbers? If you did, you are swimming in cucumbers by now and have come to realize the reason that pickles have such prominence in our culture! How do you preserve the harvest makes a huge difference in how well you can eat from your garden. When the season is in full swing, like it is right now, dealing with the abundance is the major focus of the home gardener. There are several ways to manage fresh produce that allow you to eat from your garden long after the heat of August is gone. Drying the produce is the easiest way. Beans, like my Cannellini beans (above), are simply left on the plant until the pods are crispy and ready to drop the white bean seeds. I gather them up and lay them in a dry, partly sunny location to dry for a couple of days. In Southern California that should do them nicely. Putting them away with too much moisture could result in moldy beans, and drying too long could get your produce eaten by insects, so it's a balancing act. Juicier veggies can be dried too, but they take longer and are a little more involved. If you want to dry tomatoes, or peppers, pick up a good book on drying. Look for a list of my suggested books in the appropriate appendix. Drying has the wonderful advantage of not being dependent on the power grid to keep, unlike freezing which is totally dependent on electricity. Likewise canning definitely cannot be done without careful consideration. Pickling and making jams, a subset of canning, is not quite as involved as other types of canning though it too needs to be done with some care. Pickling and jams are easier because the high acidity or sweetness (pickling uses vinegar; jams and jellies avoid botulism with lots of sugar) keeps the bad organisms from growing in your food without using a pressure cooker. A good book on canning and pickling will help you discover a whole new and delicious world. Certain kinds of fermentation have begun to make a comeback in modern times. Making alcohol has been one way of preserving grape juices, and apple jack for apples. They require no refrigeration, because most of these methods predate electricity by a couple hundred years. Again, this topic takes a lot more information and you'll have to buy a book. 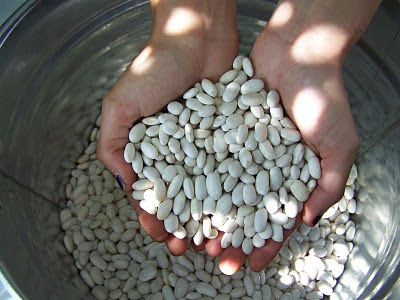 And, speaking of beans, a gardener also needs to keep the green and yellow beans picked or they’ll stop producing. Keep using the basil, continually pinch their tips – flowers and the first pair of leaves and throw into whatever you're cooking or a salad - the flowers are as edible as the leaves. Next month, you can harvest whole plants and make pesto. This constant pinching will cause the plant to grow into a vigorous small shrub! Share the abundance of all your produce with friends, relatives or a food bank. Nature isn’t stingy so carry on that tradition and share too. We all need a fresh homegrown tomato now and then to remind us how blessed we really are. August can be a difficult month for planting – for you and the plants. You'll both need extra water and you both will chance a sunstroke that could kill them much more readily than you. You, at least, should have the sense to move into the shade if you notice symptoms of hyperthermia. Plants, on the other hand, have to stay put. If you do plant on a hot day, it is not a bad idea to find someway to shade your little darlings. A stick propping up a black nursery flat, with the flat covering from the south of the plants is a tried and true way for many gardeners to provide shade for their newly planted starts. But, late in the month, it's time to get ready for the fall veggie garden and now you'll want to start getting ready for it. What to plant in the coming months is a great game gardeners play, wiling away long, insufferably hot hours in the shade. It is best to write down some of the ideas you're having for next summer's garden now. while this year's experience is fresh, otherwise the harvest of knowledge could be wasted. Of all the ways to learn gardening, the most sure and least expensive is to keep a garden journal. It is so easy now days and can be very inexpensive. If you have a computer, a digital camera and a word processing program you are set up. 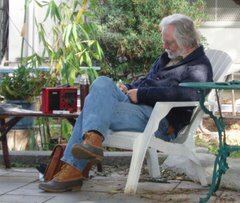 It can be a cheap camera (I found a used one on eBay) and a word processing program to preserve your thoughts for the next year's garden. If that's not your bag, get a paper notebook, draw your plans, paste in pictures from catalogs and write your observations in a multitude of colors. Or use a combination! The point is to write down things to remember and to find a way to put them together in a way that will give you enough pleasure to insure you'll do it. A chair or bench in your garden is the most perfect place to do this. Haul out a few catalogs, something cool to drink, sit down in the shade with your notebook (computer or paper) and think about the year gone by. It can be a meditation that is almost as good as eating from your garden. See below for a few catalogs to consult in preparing your next garden. But don't throw all your attention in to next summer's garden. Spend some time now to consider what you will grow in our mild winters. I'm looking through some catalogs for cabbage, broccoli, onion, lettuce and other seeds. If I order them soon, I'll have them by the end of August and I'll be starting little pots of seedlings that will be going out into my garden by the beginning of October. Below, I've listed a few of the vegetables I want to grow along with some varieties that I like. I'll order seeds to start now, and, to save on postage, I'll also order other seeds I'll be using a little later on. However, no matter the state of the present, August is the time to contemplate the fall and winter garden; I’m in my seed catalogs already dreaming of my next great adventure in the garden. Probably before the month is out, depending on this year's weather, in sheltered locations, I’ll be starting seeds of broccoli, cabbage, kale, leeks and onions. I’ll plant several different heirloom varieties of sweet peas – maybe some blends of antique varieties, usually two seeds per pot and if they both grow, I’ll prick them both out into separate homes. Sweet peas are the delight of my summer – I can't grow enough! Green Globe – one of the more productive varieties, Green Globe is usually one of the varieties available in the farmers' markets and groceries. Violetto – is not so often seen in the market. Not quite as productive but still quite acceptable. Like the name implies, it has a good splash of purple in it. Each leaf tip possesses its very own, very sharp spine. But I think they are worth it! Burpee’s Golden – there was a time when 'Burpee' was synonymous with seeds for the home gardener. While this is no longer true, way back there in that faraway time, Burpee bred a lot of wonderful crops that we still find useful today. This beet has lower germination rates than other beets, but they are worth it! From the mere fact that they don't bleed red beet juice all over your fingers (and clothes! ), Golden beets are very sweet. Sauté in orange juice. Chiogga – another heirloom. Very productive and sweet, not as sweet as the Golden, but running a close second. One of these beets, cut in half before being cooked, reveals alternating rings of a light red and white. They keep those alternating rings when roasted. Premium Crop (62 days) and Early Dividend (43 days) are two of the better hybrid broccoli varieties. If you are gardening in pots, Early Dividend is a great selection. Nutribud (58 days) and Waltham (85 days) are the heirloom varieties available today. Of these two, Nutribud is the one for container gardening. The days listed behind each variety is the 'days to harvest' from the catalogs. This refers to an approximate day by which you may expect to harvest the broccoli heads from the day you set them into the ground (transplanted out). It is an estimate only – weather conditions and other factors speed it up or slow it down, but in these four varieties above you have the idea that Early Dividend will come in first and Waltham last, all other things being equal. Bubbles – 88 days. Brussels Sprouts are a largish plant but have the added advantage of providing a rather continuous harvest over many weeks. They also can be a pain if they get aphids or whitefly because they are very difficult to police. Danish Ballhead – A late season cabbage – not so good for containers, but a reliable producer for those who wish to preserve some of their cabbage. Note that all these cabbages are not savoy cabbages. Those crinkled leaves of the savoy variety hold dirt and also make very opportune homes for slugs – and one gets a lot of slugs in long season cabbage anyway. Point One – An early cabbage that is a delight. – like the name implies, this is not a round cabbage, but forms a pointy little head of cabbage. Surprise – Another early cabbage – 'early' cabbages are usually smaller headed and more useful in succession planting and for containers as well. Ruby Perfection – For those who want a red cabbage. Small heads and early. I've found red cabbage much more difficult to grow, I'm not sure why. Little Finger – A small carrot that is good for containers – an early harvest and you haven't had a carrot fresh from the garden, you don't know what you're missing! Sweet! Mokum – This has been my number one carrot over the past five years. Productive and delicious. Thumbelina – Little round carrots that are considered THE container carrot, but I like Little Fingers better thinking they are more sweet. Still, many folks will plant these and be perfectly happy. Yaya – This may well be my new number one carrot. Bright orange six inch blunt roots, with a great flavor and will hold in the ground for a long time – which means I don't have to sow carrots in succession. There are many different colors of carrots to think about growing as well – Pinetree Garden Seeds sells a carrot mix that includes a number of different varieties and colors! Early Snowball – is an open-pollinated and is the earliest and tastiest of all the cauliflowers available. Other varieties are out there that are tasty but I think this one takes less work and compares well with the others. There are, though, several varieties that are quite colorful, Green Harmony is, of course, green; Graffiti is purple and Cheddar is yellow. Not sure how I feel about them, but then I'm not a huge cauliflower eater. Large Prague Celeriac – I'm not even going to list celery. In our climate, I don't think it's possible to get a sweet celery that isn't as tough as a sisal rope! Celeriac, on the other hand, has that delicious celery taste, is easy to grow and works as well as or better than celery in soups and other dishes. You can't fill it with peanut butter or cream cheese like you can celery, but how healthy is that anyway? And if that's the only advantage, stick with celeriac! Five Color Silverbeet – All the chards taste about the same to me, so I like to plant this chard to get all the different colors – some of them are quite wild. (Australians call chard “silverbeet” which is a nod to the fact that chard and beets are the same exact species of plant.) Dependable and beautiful, you can't beat this one in the garden or the kitchen. Delfino – A new variety that puts the old 'Slo-Bolt' to shame. Holds better than older varieties in heat (cilantro does not like to grow in heat) and the plants are a little larger for a better and longer harvest. Fino – Usually used raw or cooked in Italian cuisine for its sweet, anise-like flavor, don't let it go to seed or you'll have this all over your garden as well. Chesnok Red – The three varieties listed here are all heirloom varieties. This variety doesn't store so well, but the taste it holds even after cooking is worth the trade off! Music – A slightly spicy, incredibly flavorful garlic, this is one of the most popular types around. Nero di Toscano – A three feet tall plant with dark, meaty, puckered leaves, the color of a blue spruce. The striking ornamental leaves have a fine flavor harvested young and cooked simply in olive oil. Carina – Leeks have been divided into 'over-winter' and 'summer' leeks. Over winter are usually larger and take something like 110 to 130 days. In cold climates, these leeks stay in the frozen ground to be harvested out from under a blanket of snow. We usually don't have to dig them out from under the snow, but the slower growing leeks are larger. King Richard – A 'summer' leek, this one grows nicely in our winter and quickly makes a decently edible leek in something like three months. To get a longer white part of the root, bring up the soil around the base of the plant – even though the catalogs say we don't need to do this, if you do, you will be rewarded with more usable root. more varieties than you can shake a stick at – or grow a mix! There are many different colors and types, get as many as you have room for! Ha! I usually can't keep myself to less than 10 varieties at a time! Italian Red Torpedo – Peaceful Valley Farm Supply has these as 'sets;' young plants to set out. This is my very favorite onion. Onions are difficult to grow by seed unless you plan on taking two years to get a good onion. Italian Flat Leaf – A brighter, more intense flavor. Super Sugar Snap – I admit that I've mostly given up on peas. They take lot of space and don't exactly overwhelm a person with production, they get mildew and croak early and I'd rather grow another row of fava beans which are much more productive. Yukon Gold – A ton of varieties are available, Peaceful Valley Farm Supply will have seed potatoes available in mid-October. French Breakfast – The standard radish for dependable crops. All radishes are easy to grow and are very quick to harvest – usually around 20-25 days. Easter Egg – A fun radish that is great for children (and the young at heart!) with white, red, purple and intermediate colors between those. Purple Plum – A lovely purple skin with white flesh – milder than most of the rest. Bonilla – Onions are a hassle (and don't really cost that much in the market), shallots are easy to grow and replace the expensive shallots one would need to buy at the store. This hybrid shallot is quick and easy from seed. I got a remarkably good crop with little effort in my first year to grow them -even though I got them in rather late! Dried, they make a good long term storage item. Olympus – Another easy to grow shallot from seed. This one is white and also stores well. Melody – A semi-savoy spinach. Most of the spinach we remember from way back were all savoy spinach, but savoy leaves (wrinkled), hold dirt better than smooth so I'm all for leaving the savoy spinach behind. Space – A smooth spinach that is easily cleaned and has that taste of fresh spinach I didn't like until adulthood. Now I love it, this one is good in salads as well as cooked. DeMilano - A lovely flattened turnip – the best for container garden and very productive. Purple Top White Globe – Will get to be the size of a small foreign country if you let them, but they are better when small. You can also plant perennial herbs and perennial flowers. Try some fun annuals like calendula, larkspur, poppies (bread, California or Iceland types), sweet peas, and venidium. BOTANICAL GARDENS; 660 Compton Street, Broomfield, Colorado 80020, 720.880.7293 You can use the button on my blog to link to Botanical Gardens and your purchase will benefit The Learning Garden. They have an excellent selection of open-pollinated and hybrids. Their seed packets are colorful, their prices are excellent and the seeds are fresh and delivered promptly. I also like their cloth bags and they also sell the paper pot maker designed by Richters' Herbs. 707.459.6410 This is a good source for open-pollinated seeds and often have varieties not found elsewhere. They also sell packets of grain seed – grow a little wheat, some oats or rye? Don't dismiss this out of hand – I had a wheat field in my front yard once. It is a good thing to support organizations that do credible garden research. FEDCO SEEDS; PO Box 520, Waterville, ME 04903; 207.873.7333; A very funky catalog that makes me think of the Trader Joe's Frequent Flier provide good quality open-pollinated seeds. While their focus is on 'cold-hardy, short season' seeds, we can use a lot of them here. As of August 31, they will no longer take orders for 2009. They begin to prepare for 2010's growing season. NATIVE SEED/SEARCH; 526 N. 4th Ave. Tucson, AZ 85705; 520.622.5561; Like Seed Savers Exchange, this is a non-profit organization that exists to save seeds that have been grown for generations and represent a genetic diverse collection that mankind cannot allow to fall into obscurity. Their efforts are centered on the Native American seeds of the desert climates of Arizona and upper Mexico, which, despite the challenge of desert conditions still represent a disproportionate portion of our modern food crops. PEACEFUL VALLEY FARM SUPPLY; PO Box 2209; Grass Valley, CA 95945; 916.272.4769 A fair priced purveyor of more than just seeds. This is the company to order cover crop seeds and tools as well as veggie and flower seeds. Their catalog is so chock full of data on pest control, fertilizing, cover crop seeds and irrigation, I have use it as a text for organic gardening. PINETREE GARDEN SEEDS; PO Box 300, Rt. 100; New Gloucester, ME 04260; 207.926.3400 This is THE catalog where I order most of my seeds – they are the least expensive. How? The packets are smaller, fewer seeds. And that makes good sense for us with smaller sized gardens. If I want more, I can order more packets – but usually I order several varieties with which to experiment. SEED SAVERS EXCHANGE; Rt. 3 Box 239; Decorah, Iowa 52101; 563.382.5990 Membership fees $40. Free brochure. This is the other main source of seeds for me. I have been a member for over five years because I believe in the work they do saving the rich heritage of heirloom seed varieties that might well be a thin green line between us and the Monsanto's of this world that are striving to control our food supply. There are many other seed catalogs out there, some of them quite fun. I used to love to look through all of them and indulge dreams of acres of land on which to grow vegetables until I learned that subsidiaries of Monsanto were buying up some of the old Mom and Pop seed houses and keeping the cute old names. Seminis, Monsanto's seed supplier also lists some of my old favorites as sellers of their genetically modified seeds. Firms like Burpee, Parks, Cooks Garden, Nichols Garden Seeds are listed on the Seminis site as dealers for Seminis. I have changed my recommendations to these few that clearly state they do NOT sell genetically modified seed. I just discovered your website by clicking on your name on a comment you made at the Path to Freedom website. I'm in total agreement with you that we need to be growing our own food as much as possible, because we can't trust the multinational food corporations to provide us with food that is healthy. And now these same corporations are in cahoots with our congress critters to make growing food problematic, and probably criminal. Right now in the senate there is a bill—Senate Bill 510 that makes what you and I do a criminal offense if passed into law. I just wrote an article about it at my website—www.themicrofarmer.com—if you would like to read what they have in store for all of us. I think we are in for the fight of our lives.